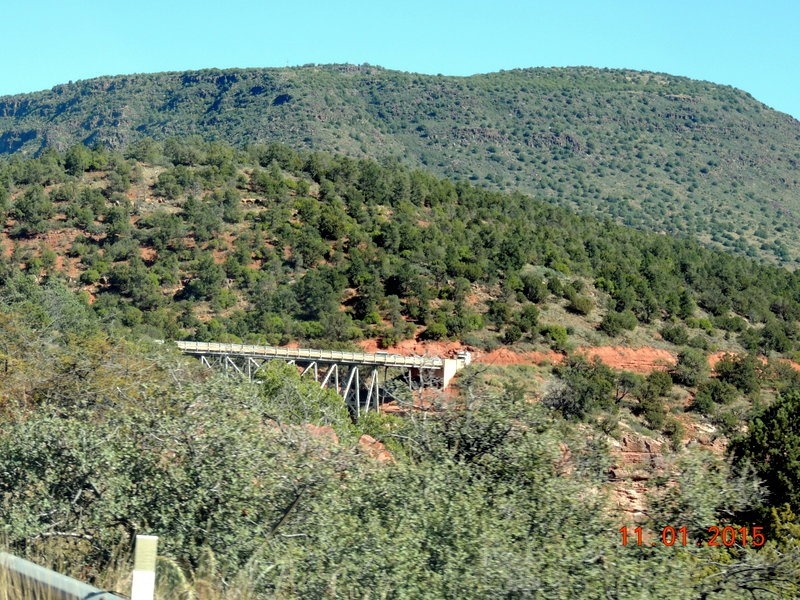 Saturday- We left Williams at about 10:30, driving east on I-40 to Flagstaff and turning south on I-17. We turned off I-17 at the Cottonwood exit, driving 8 miles to the Verde Valley Thousand Trails where we are staying two nights for free, under our program with them. We have not used Thousand Trails much this year, but the membership allows us a big discount at the park in Sun City. We parked in our site, H-13, a newly renovated site, 50 amp/FHU. After setting up, we went to the café for lunch. Bob had a hamburger and I had the BLT. We walked the dogs, then left to drive north to Montezuma Castle NP. 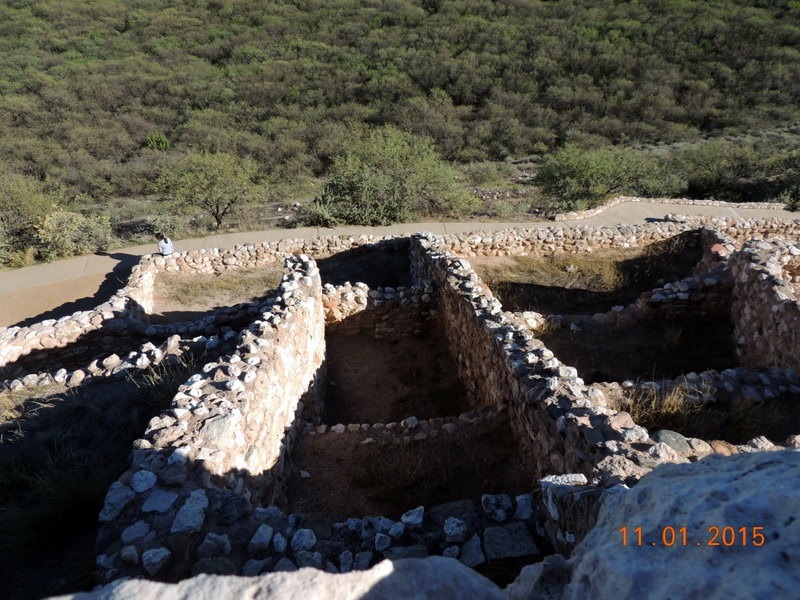 In the 1800’s when people found this Pueblo, they did not think that the people who lived there 900 years ago could have possibly built such a sophisticated structure. They decided that Montezuma had to have designed it, even though it was built well before Montezuma was born. 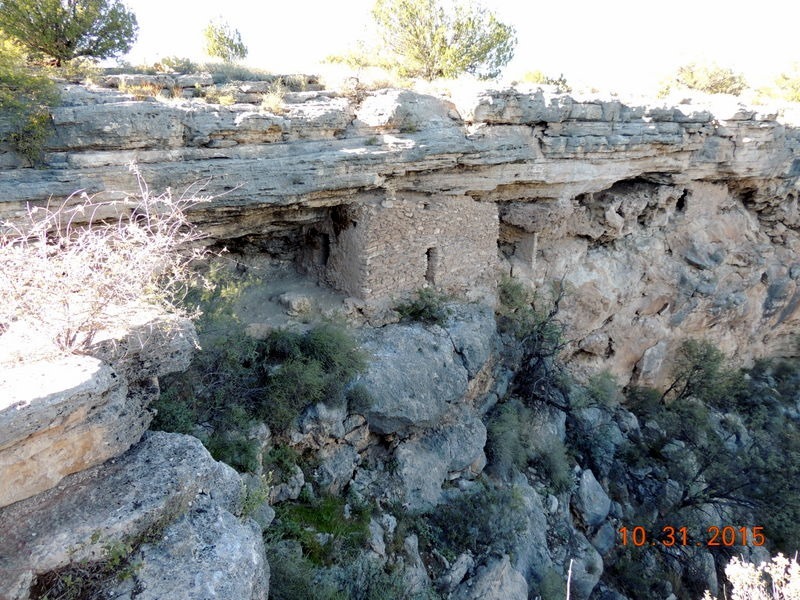 This pueblo was built into the side of a limestone mountain. Ladders were used to access the rooms. The Pueblo is 4 stories high. The thought is that building the structure into the side of the mountain meant that they did not have to build roofs and walls. The residents were farmers and hunters. the dwelling appeared in about 1125 AD. 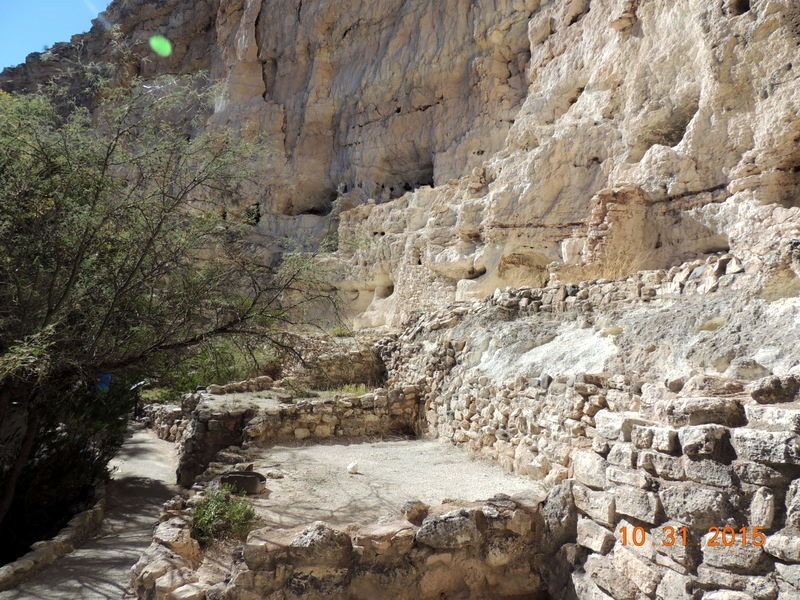 By 1150, the Sinagua people had made significant additions to the pueblo. They migrated away in the 1400’s. This is what the inside would look like. Seems pretty ingenious to me, as it was cool in the summer and warm in the winter. 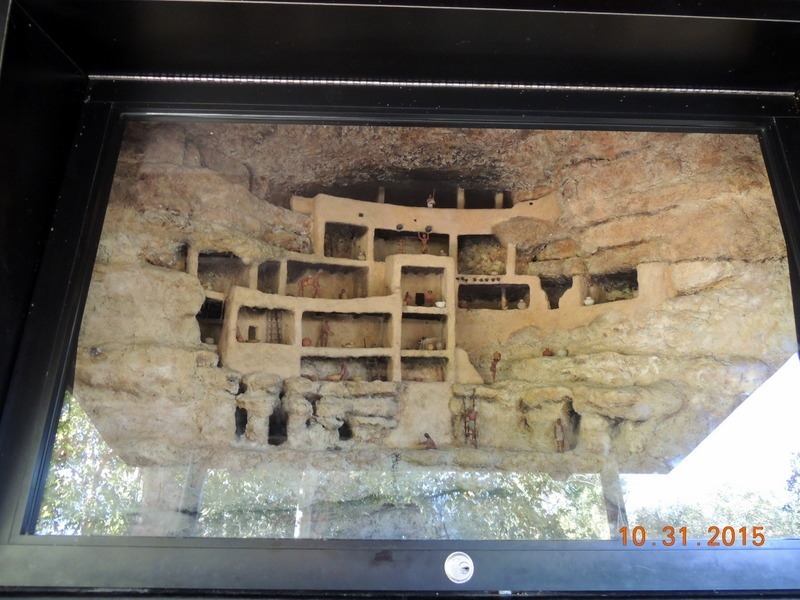 Below is a diorama of the Pueblo. The area around the structure was flat, fertile and had water. 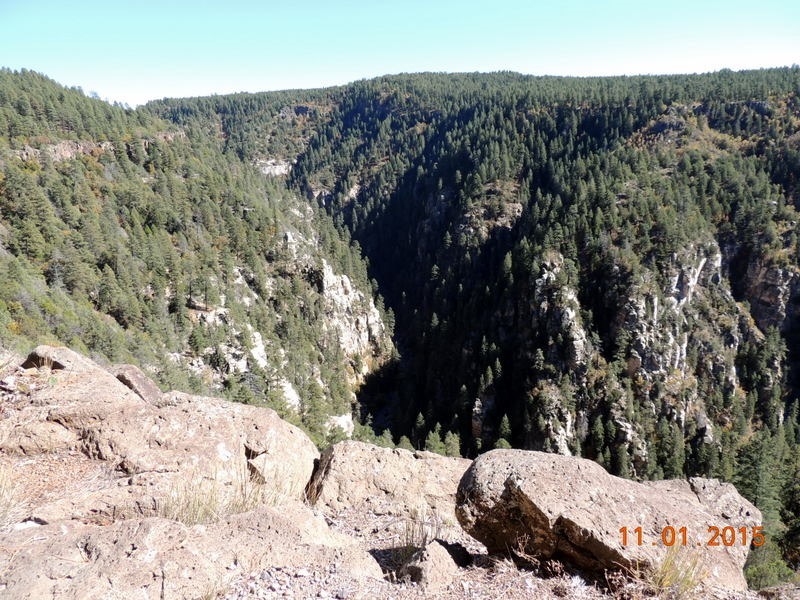 Just a short walk to the west, there was a second pueblo, called Pueblo A. We walked along the river and through what had been their fields. 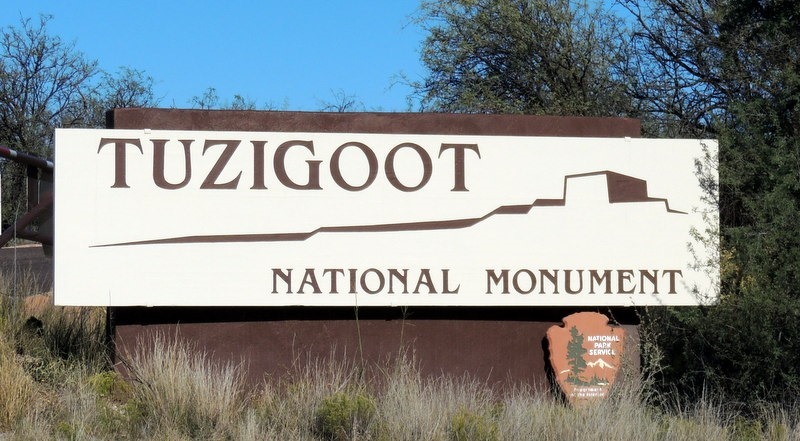 We left and drove north on I-17 to Montezuma’s Well. 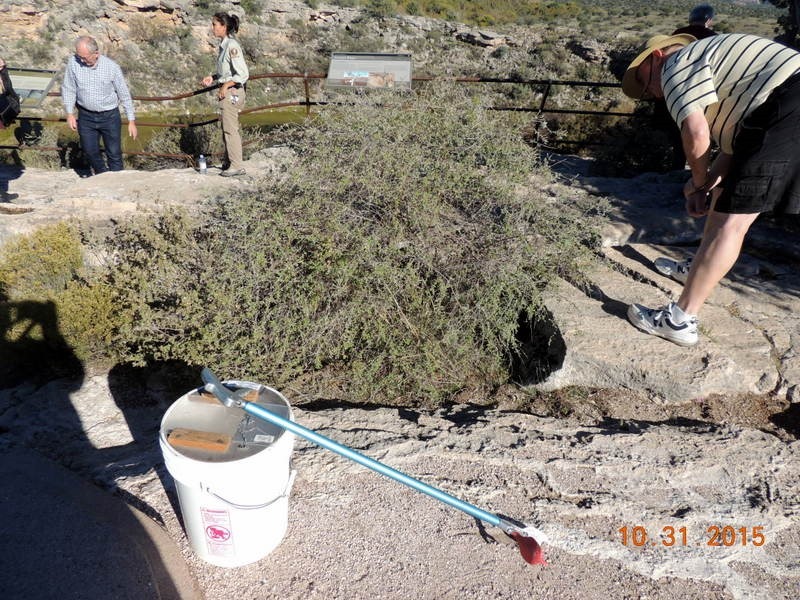 This is a spring, out in the desert, which has been here for centuries. The water is a consistent 74 degrees. There are no fish in the well, due to the high carbon dioxide level, but there are a form of leaches in the water. Because there are no blood bearing species in the well, they live on the various species that live in the water. There were ducks floating on the water, but I guess they are protected by their feathers. The area around the well receives barely 1/3 of the national average of rainfall, for the US, yet the well contains over 15 million gallons of water. 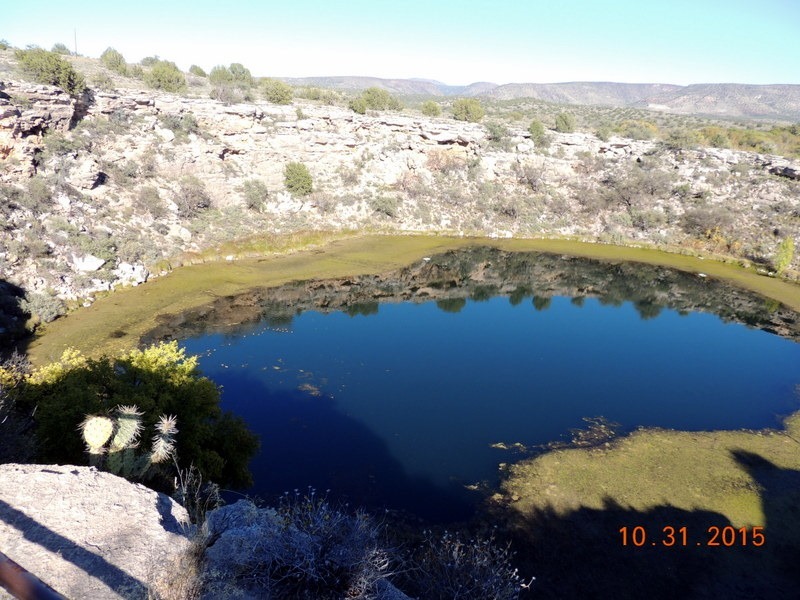 In 2011, divers mapped the well and the spring that brings the water to the area. There was a Pueblo built into the wall, and I suspect we were standing on the hill on top of some of this Pueblo. Below, Bob is looking for a rattlesnake which is hiding in this bush. The ranger assured us it was safe as long as we did not disturb the bush. 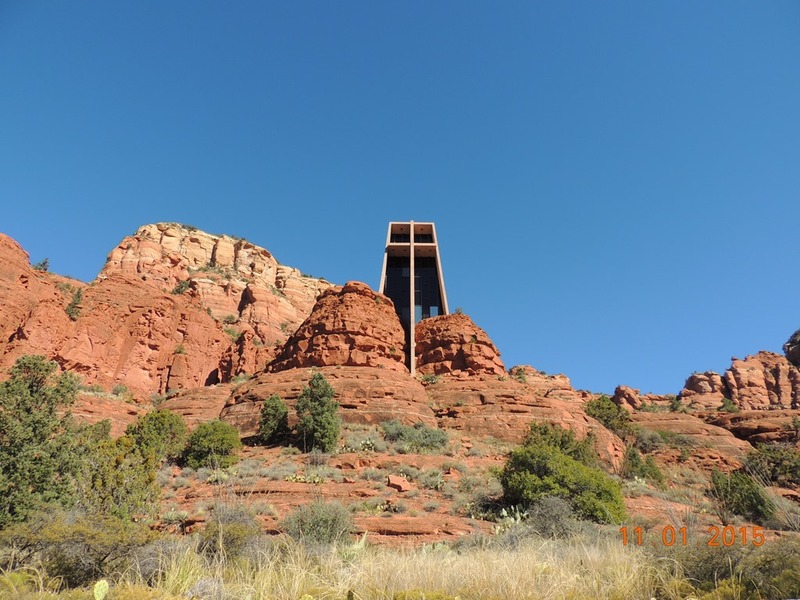 We hiked back down the 45 steps to the parking lot and drove a dirt road , parallel to I-17 and the exit for Sedona. We drove over to the Baskin Robbins in Sedona for the $1.31 scoop of ice cream. We each had a scoop of ice cream, then drove back to Cottonwood. We stopped at the Walmart for a few items and to pick up some cash. We returned to the MH, walked the dogs, then went to dinner at the Café. I had the fried shrimp dinner and Bob had the pork chops. Both had green beans and a baked potato. The food was very good! We returned to the MH and found that we could not watch any TV. The satellite has broken. It would attempt to run, then stop. We are in a hole, so we are unable to get local channels and our internet was poor. We read then went to bed. Sunday- We went for omelets at the little café in the park. I had a ham and cheese and Bob had the meat omelet, with bacon, ham and four cheeses. they came with toast and hash browns. This café has an excellent cook and the prices were reasonable. We returned to the MH. We left around 10:30 for Sedona. 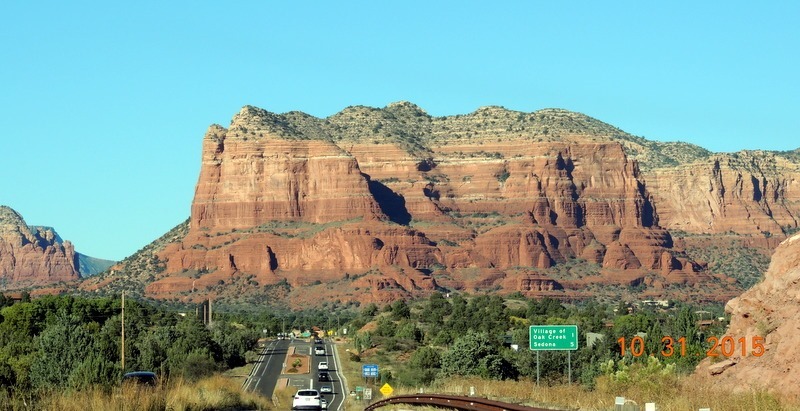 We drove north again on I-17. 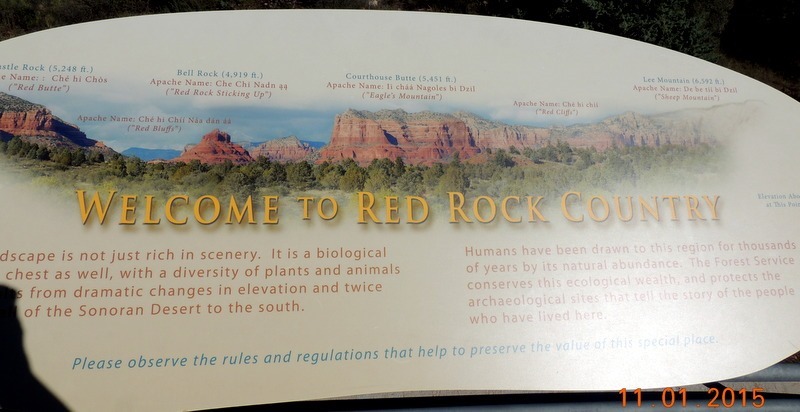 We exited and drove towards Sedona, stopping at the National Park visitor center. The ranger gave us a map and told us what to see and how to arrange our tour. The sign above shows the formations in the picture above. 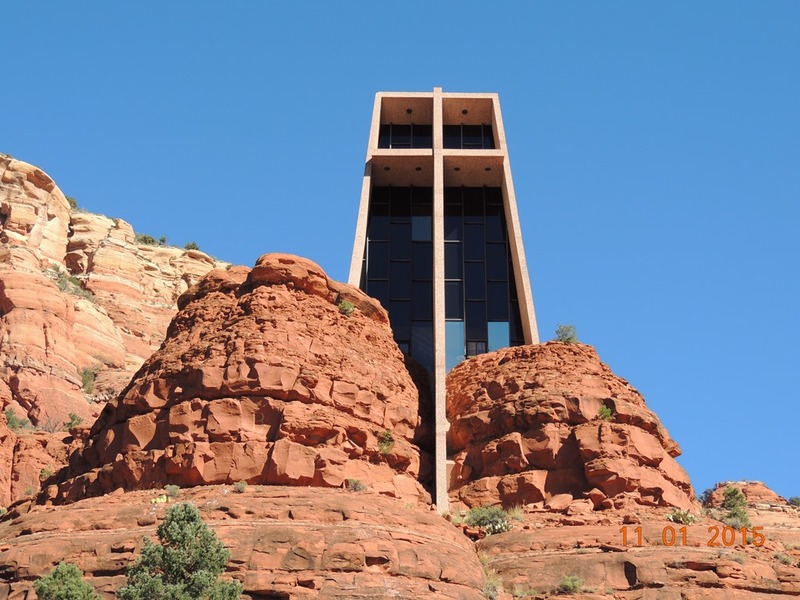 We drove by the Chapel of the Holy Cross, which was built into the rocks. There is a celebration of Holy Mass each Sunday, so we were unable to go into the church. Then we went to the airport overlook. 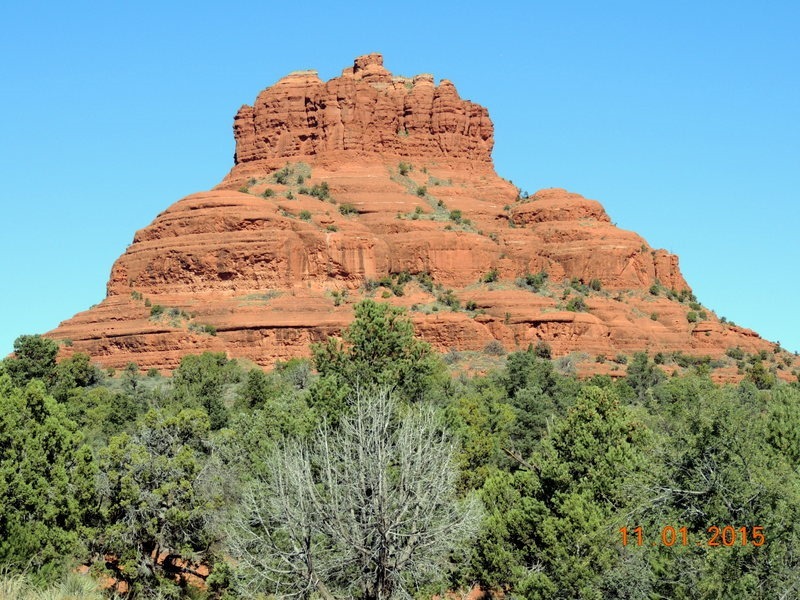 This is the view of the town of Sedona. We decided that since we had a late breakfast, we would drive up the canyon and have a late lunch. We learned two things. 1, don’t drive this on a Sunday. It was very crowded. We were unable to enter some of the pull outs due to the crowds. 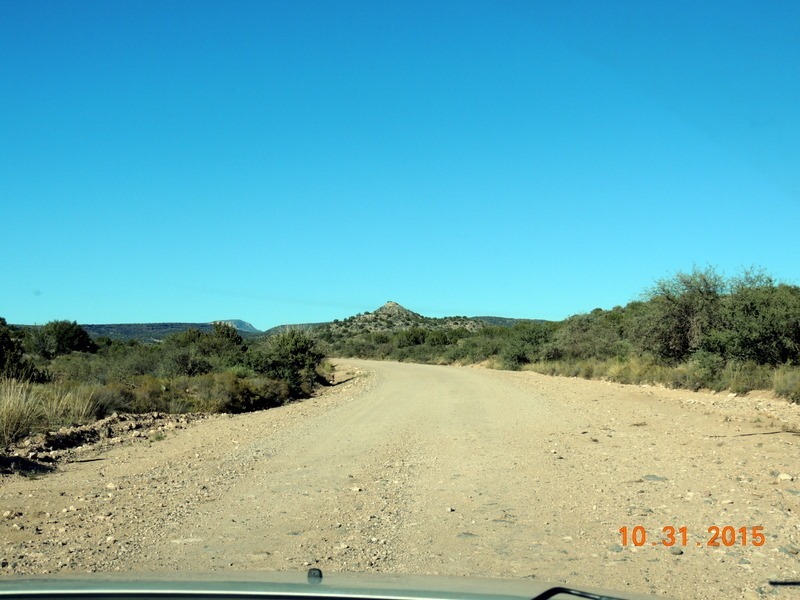 2, it was very hard to get pictures of this scenic area, as we could not pull over safely to take the pictures. Here is what we could get…. We reached the Oak Creek Vista, which is basically the end of the canyon. We stopped to look back on where we had driven. Above you can see the winding road. 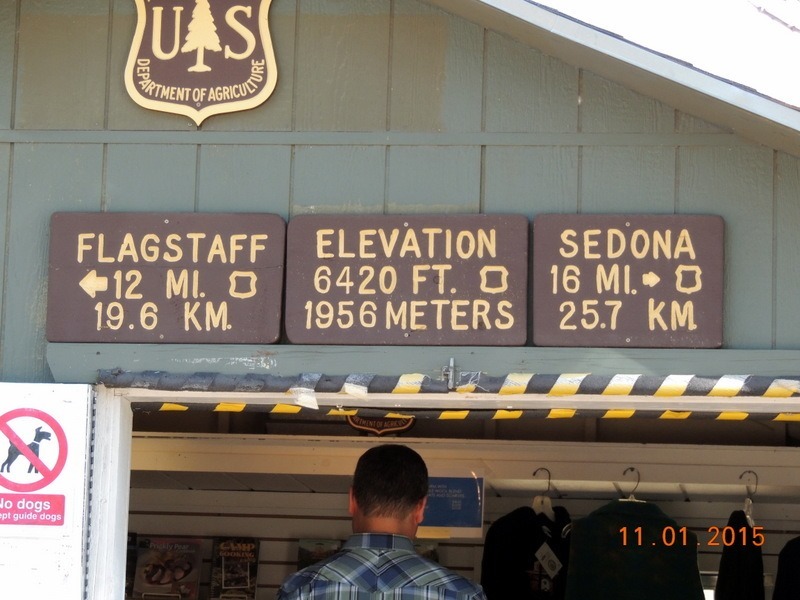 There were Native American vendors, who are approved by the National Park Service to sell at the view point; they were selling jewelry, pottery, baskets and hats. The vendors rotate through and are from the different tribes in the areas. We started our return trip and tried to take more pictures. We returned to Sedona and went to Oak Creek Brewery for lunch. Bob had a Porter for his drink. He had a brat sandwich with some very good onion rings. I had the best quesadilla that I have ever had. It was chicken, pepper jack, cheddar, and poblano peppers. 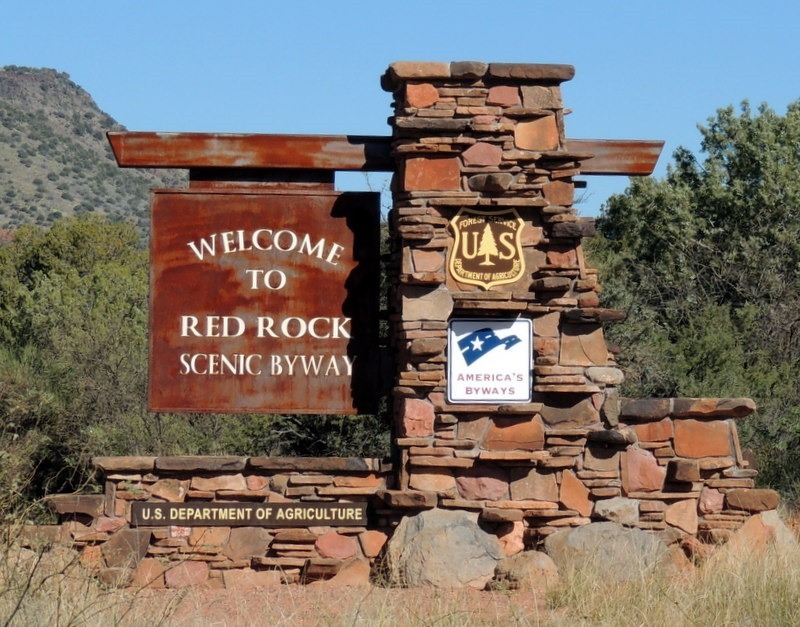 We left and drove south to the Red Rocks 7 mile loop. 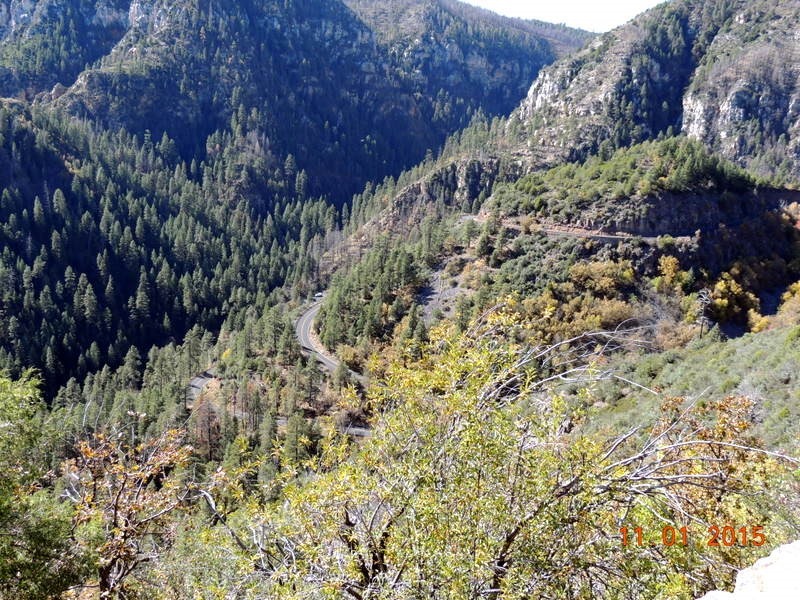 We turned left to take the route, which eventually returned us to Hwy, 89A, south to Cottonwood. 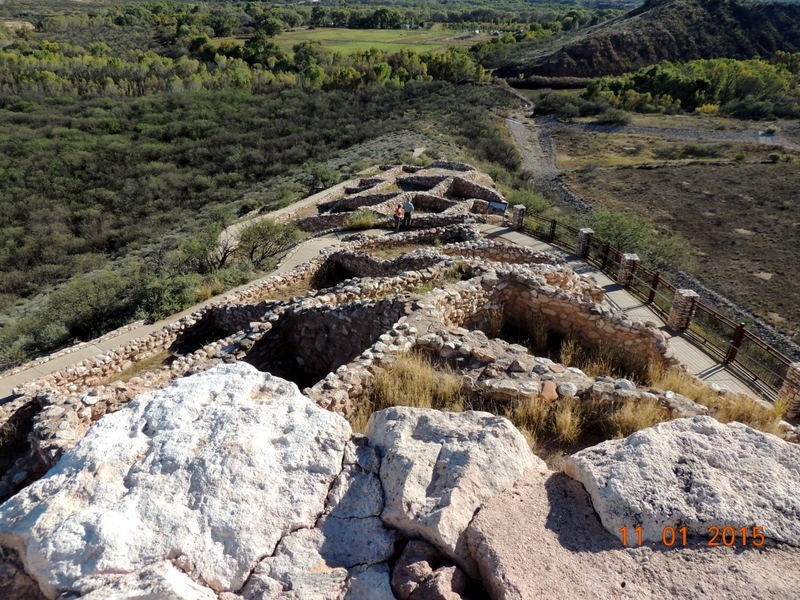 We continued through Cottonwood and went to Tuzigoot Pueblo NM. We walked around the Pueblo and came to this area. It is the only area with a “door”. The archeologists think this was a food preparation room for their ceremonies. We think it is where they prepared the Pot Luck Dinners, LOL! 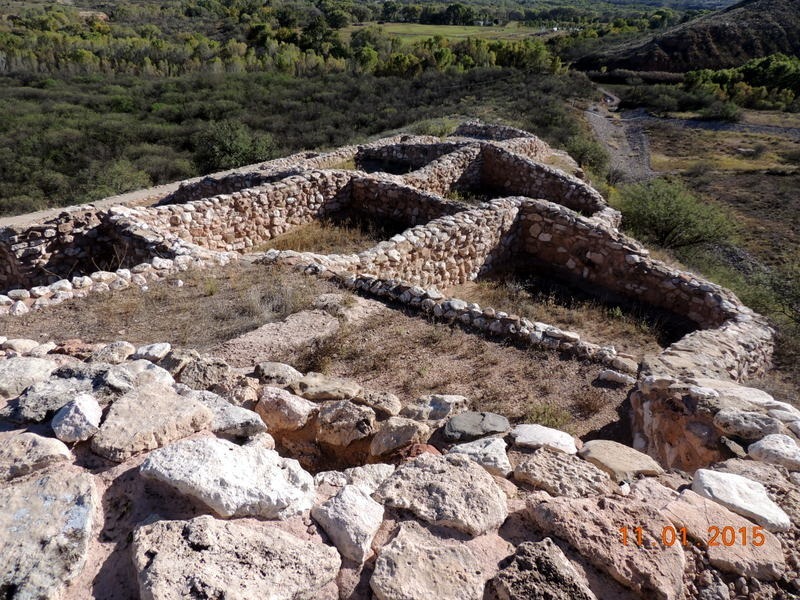 Tuzigoot is Apache for “crooked water.:. 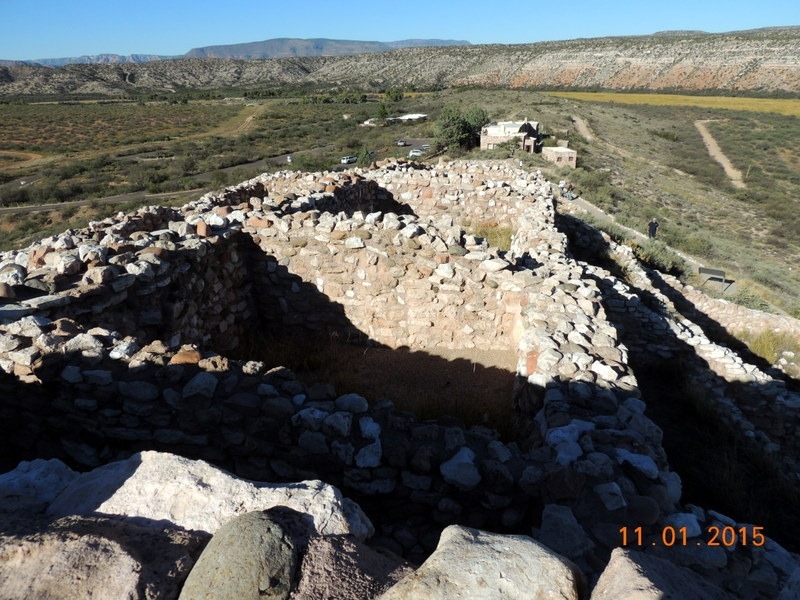 This southern Sinagua village was built between 1000 and 1400 AD. 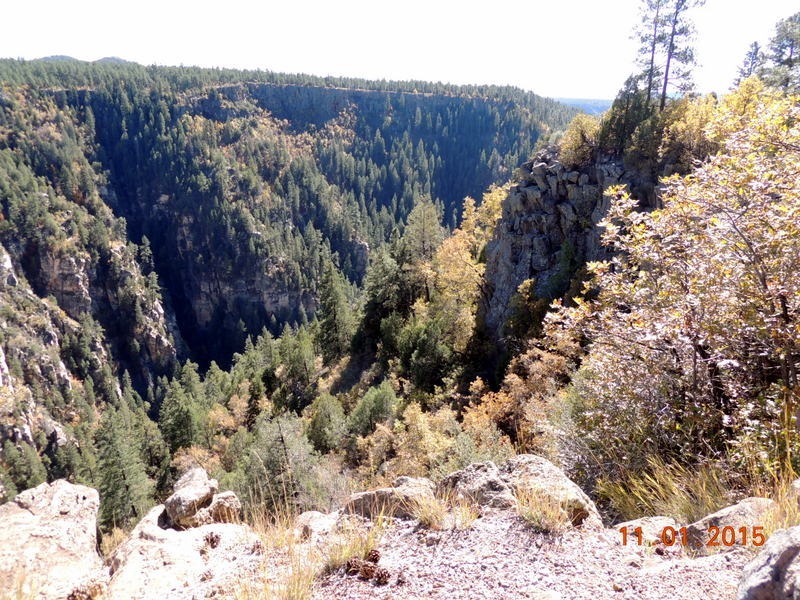 It crowns the summit of a long ridge rising 120 feet above the Verde Valley. 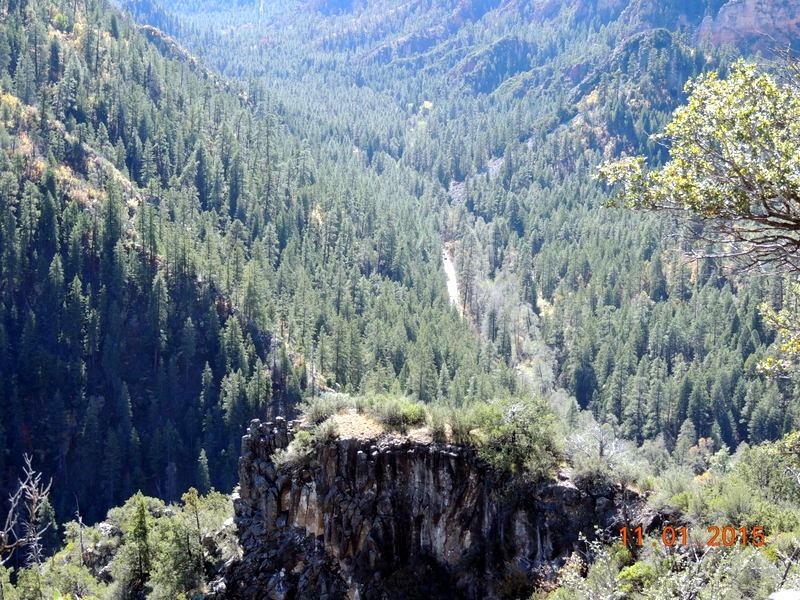 The Sinagua were farmers and there was flat farm land below them and the Verde river for water. 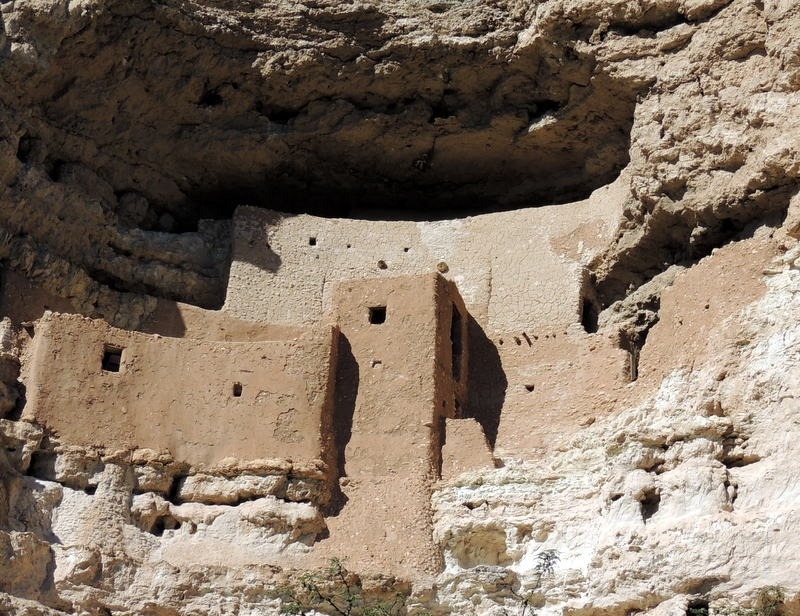 The original pueblo was two stories high in places with 87 ground floor rooms, and a total of 110 rooms. 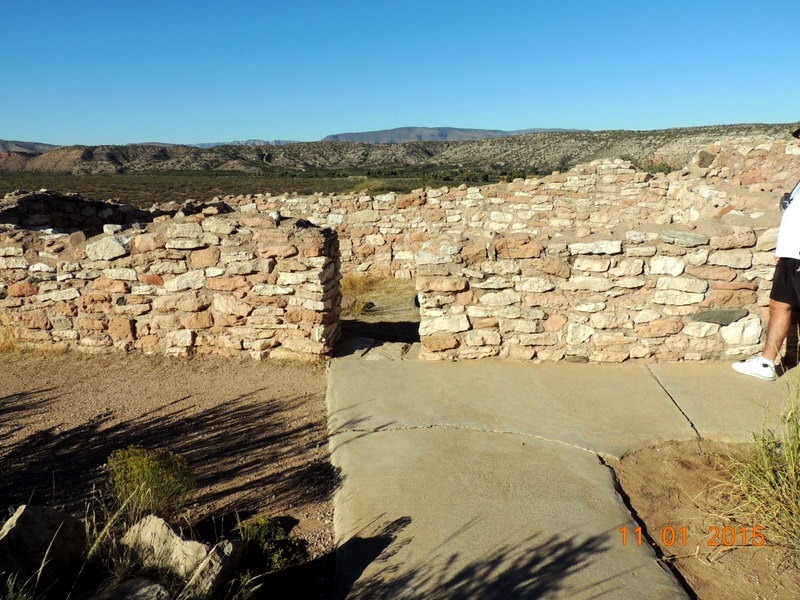 In the 1930’s the pueblo was rebuilt, using more modern cement, to resemble the original footprint of the dwelling, as the original building was built with sand grout, which deteriorates over time. .
After touring the Pueblo, we drove through the town of Clarkdale. There looked like a very interesting Copper museum, but it was not open. 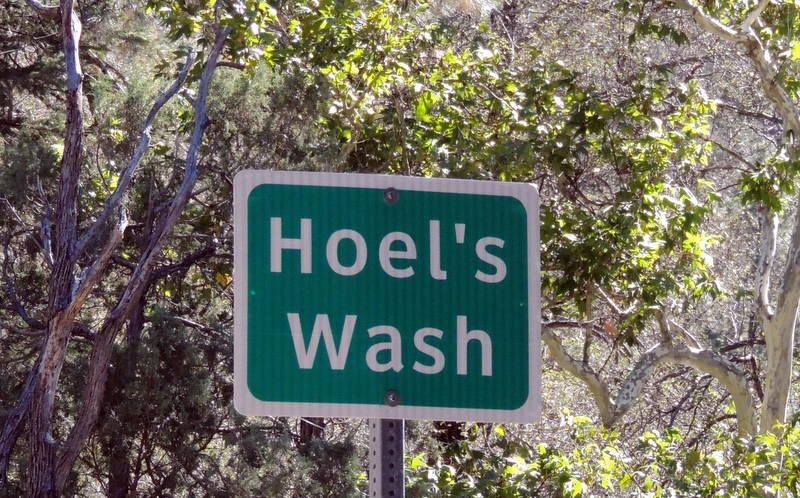 We stopped at a car wash, as the car really needed a washing. Then we returned to the MH. We ate left overs for dinner, read our books, and went to bed. Monday- Bob took the sheets and towels over to the laundromat at the park. While he was doing that, I worked on the blog from last week. I did not get it finished by the time Bob returned as we have been busy tourists! We packed up the MH and drove out of the Thousand Trails at about 11:00 after hooking up the car in the lower parking lot. 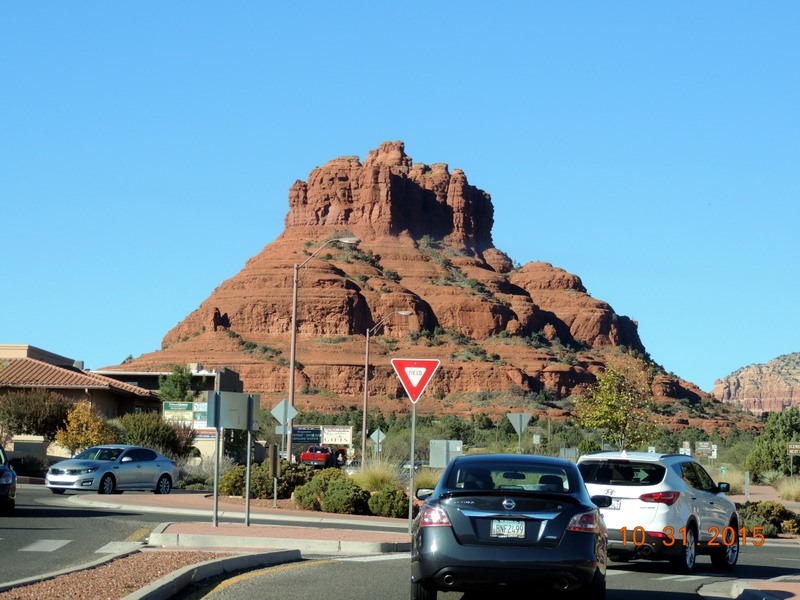 We drove south on I-17, stopping at a rest area for lunch. I drove the rest of the way through Phoenix on I-101 to the Freightliner facility at the intersection of I-10 and I-101, in Tollison. We had been followed by another Alfa. As we were getting off, we were all waving to each other. We have no idea who they were, but I am sure we will run into them again! We stopped for diesel at the Pilot, the went across the street to the Freightliner. We parked the rig in a 50 amp/FHU site, then Bob went and checked in at the office. He and the guy came out to the MH and completed the paperwork. They are going to take the MH in for its routine maintenance at 7 AM, tomorrow morning! Bob took the bikes and the rack off the back and locked them to the fence behind us. There is even a nice little dog park here, which the dogs enjoyed. We left and went over to the Costco for gas, then to look a new HD TV’s as we are going to have to make a change when we set up a new satellite. We returned to the MH, watched TV over the air, and ate leftovers for dinner. Tuesday- We were up and ready for the tech when he arrived to take the MH in for its maintenance. We packed up the dogs and went to McDonalds for some Egg McMuffins for breakfast. Since is was still so early, we returned to the RV Lounge and watched the Today show. We had the room to ourselves, so we let the dogs off their leashes and let them roam in the room. Around 9, we left and drove north to Paradise RV Park. We checked in at the office and paid for the rest of the five months we will be here. Because we paid for six months, started October 1, we had a big discount through the Encore early bird program. Our average monthly cost is $379, not including electric and propane. Definitely a good deal! We picked up our mail and while we were doing that, Bob received a call that we needed a new fuel pump for the MH. He okayed the repair and gave them the information for the extended warranty. This added time to the repair work. We stopped in and said hello to MaryAnne, who was leaving to go to Mahjongg. Then went over to visit with Mike and Linda. We hung out with them for a couple of hours. The dogs enjoyed visiting with them and with Sable, their pug. Sable has a degenerative neurological condition, but seeing the girls really pepped her up. She has trouble walking, but was trotting around saying hello to all of us. Mike and Linda had an appointment at 1, so we all left, taking both cars and went to In N’ Out burger for lunch. We parked and Bob took the dogs to an outdoor seat with Mike. Linda and I went inside to get our lunch. We sat out until almost 1, then left to return to the Freightliner facility. It was almost 4:30 when they completed the maintenance and the installation of the new fuel pump. Our extended warranty paid over $1600 for the fuel pump repair! Two extended warranty issues in two weeks, guess they will not be happy with us! At least we feel we are getting our money’s worth out of our extended warranty! Bob drove the MH and I drove the car to Paradise RV Resort in Sun City. Security took us to the site, we parked, got set up, and I cooked dinner. We watched TV over the air. We were really tired, so we went to bed early. Wednesday- We continued getting set up as we only did the minimal last evening. It rained during the night. Both of us were up early, as we had gone to bed early. At 10:15 I picked up LInda and MaryAnne and we went to Kneaders for brunch and a girls morning out. We sat talking and had a great time. Meanwhile, back at the MH, Bob continued to work on tasks that he needed to complete. He was able to get the satellite working, as he thinks it was the plug at the MH connection. I returned and took off for Mahjongg at 1 PM. MaryAnne, Grace and I played. I won the first two games, then won one more later. It rained again while we were playing so I ended up having the get paper towels to dry off my bike seat. When I returned. Bob and I went to the Library to look at Consumer Reports magazine. We wanted to check their ratings of different TV’s. Even though Bob was able to get the satellite working, but we are still going to go through with working on the upgrade. Our DVR box is not doing well, either, so it really is time. At least with the satellite working we have some time to do some thorough research. Before we left, we put dinner in the crock pot. We returned to eat dinner, watch TV, read, and go to bed. Thursday- I went to water aerobics while Bob continued to do things around the MH. I returned and Linda wanted me to go with her to her step-mothers house. She picked me up at about 11 AM. She had moved her step mother into an Assisted Living and she is trying to straighten out the house. I ended up taking 3 big bags of books and one bag of quilting material. I am planning to take a quilting course and here is free material and supplies! When I returned, we went to Joanne’s to sign up for the class and because I needed some items for card making. I had worked on a few and ran out of sticky tape. We had a $15 gift card for Stone Cold Creamery, so we stopped and each had a cup of ice cream. We returned and I worked on my few Christmas cards that I still sent out to family members without email. At 6, I went for my mani/pedi. Bob cooked dinner and he ate ate then and warmed it up for me when I returned at about 7:30. Bob has been working on figuring out how we are going to set up the new TV and satellite dish. We are looking at moving the TV and the recliner so that we sit side by side in the MH and can look directly at the TV. Friday- I left and went to the card making group at 9, meanwhile, Bob cooked the dog food. When I returned at 11, we left to go run errands. We stopped at Jimmy John’s for lunch, then went to Lowes to return a meat thermometer that did not work. Then we were off to Walmart and the Library. The Library was having a book sale, so we bought a bunch of books on CD and some travel books. We stopped at CVS to pick up Bob’s prescription. What a pain! Bob had ordered the medication via snail mail. He has been hounding CVS/Caremark, our new mail order pharmacy, to get the prescription to him. They did not and he ran out of the medication. So he had the MD send a 30 day supply prescription to the local CVS and then a 90 day to the mail order. The folks he talked to wanted him to pick up all of the med at the local CVS, but there are states where there are no CVS stores, so he had to keep trying to explain to them why that was not appropriate for us! We returned without the prescription, as it was not ready. We took a short nap, then Bob went back to the CVS to pick up the med. At 4, we went to happy hour at Linda and Mikes RV. We have a nice time and met Sheila and Wayne, who are new to the park. They had purchased a park model, but are also RV’ers.